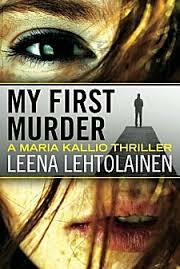 Although it was chosen by the 4-Mystery Addicts reading group I was interested in this book because I’m of Finnish ancestry and have cousins there, have visited there, etc. Also, as is evident from this blog, I really enjoy non-US lit. But in her favor she says she has “masculine muscles,” is competitive enough when pushed, and can hold her own with her male co-workers. Maria’s goal is to get her law degree and work with women’s issues – not to be a full time detective. I tried really hard to like this book but until I got the hang of it, it was very confusing with the indistinct characters with similar or unusual names, their booze and tangled love lives, Maria’s youth, etc. Finally, about half way something clicked and I started over. Yes, I enjoyed it. The rich, single and womanizing Tommi Peltonen is dead – hacked on the head with an axe outside the lake house of his parents where he and 7 other members of his chorus group were staying to practice. The murderer is most likely one of group- Mira (f) , Riku (m), Pia (f) , Sirkku (f) , Timo (m) Tuulia (f), and Antti (m). (I’m not even going to try for the long Finnish last names.) And Tommi had had affairs with 3 of the women and a couple of the men owed him money. An added twist to the story is that Maria knows them as friends – it’s a smallish community.